You and your staff put so much time, patience and effort in to my couches. I come home to my customized furniture and it brings me joy! I’m very grateful. Sofa Biz appreciates the feedback! Your workmanship is top of the line and it was pleasure to work with Sofa Biz. The materials are top quality and we are just delighted with the Sofa, Loveseat and Chair! You guys just completed the job on my 6 cushions that I wanted re-foamed and wrapped. Superb workmanship, timely delivery, and easy to do business with. 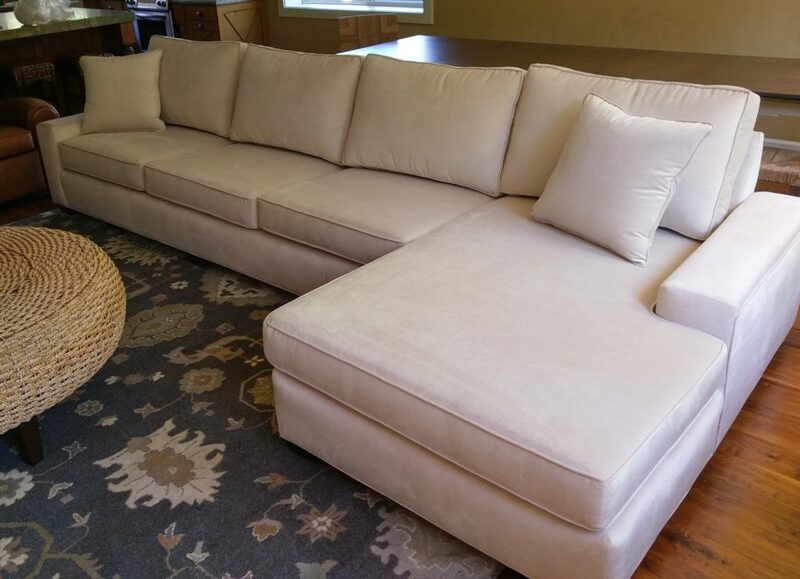 You put new life back into our 20 year old sectional, and we couldn’t be more pleased. You have my recommendation to anyone I talk with. It’s good to find local businesses still doing it the old fashioned way, caring for the customer. Thanks. Sofa Biz did a fabulous job recovering my chair and ottoman. You certainly went the extra mile to assure perfection. I would hire you again in a minute. This my third covering with you, and I have been happy every time. Thank you so much. The owner has some of the most lovely couches on display with leather and fabric on display on his show room floor. They can make custom made couches and seats for you. This is how to get furniture that does not look like your neighbors! High quality services with reasonable prices. I am a repeat customer have always received excellent service and work since I started going to Sofa Biz in 2006. Highly recommend. I wanted to let you know how pleased I am with the 8′ sofa you reupholstered. The light blue (Ocean) fabric looks so nice in our family room. Your workmanship is excellent! I am so glad I chose your company to do my couch. We were so happy with the furniture you reupholstered for us! We just LOVE it. I just wanted to thank you very very much for all the effort to replace the back pillow on my chair, and recover the old one as well. I am very happy with the “new” chair, and I will be back for more. Thanks for going the extra mile. Most people don’t these days. We are so happy with our sofa and chairs that you covered in a new beautiful designer fabric. Our life-long neighbors were so impressed, they are returning their recently purchased sectional and having you make a new one! It is great that your company does both and we appreciated the service and quality. You even called half way through to see if we wanted to inspect it. Just brilliant workmanship. We have had a very good experience working with Sofa Biz over the years. I have a sofa they made over twenty years ago that is still alive and well. We had two custom sofas made recently and they turned out beautifully. They were very good about helping us be happy with ALL of the details, such as testing durability and ease of cleaning of the fabric and a beautiful custom finish on the legs. They are the most helpful business I have worked with. High quality work. Our wing chairs that have been in our family for generations were recently reupholstered by Sofa Biz and we were shocked and amazed how beautiful they turned out! Amazing what a great quality fabric and workmanship can do for a chair set we were about to toss out! So glad we didn’t. We also had a custom sofa built a few years back and it’s still like new. You guys are the best! Thank you David (of Sofa Biz) for your great customer service! I love the sofa and although I may never know what caused the marks on the cushions, I am so grateful I had you reupholster! You are a great asset to Sofa Biz! We just got new cushions for our motorhome. They came out so fantastic! We just love them. Thank you for your talent and great work. I tell all my friends about Sofa Biz! back for more. Thanks for going the extra mile. Most people don’t these days. My conference chairs were recovered in leather by Sofa Biz and they are absolutely fabulous! They are beautiful and turned out better than I ever expected. Dog ate your homework, and then your favorite chair too? Sofa Biz is the Best! This sectional came back so beautiful.